Batwing style bowtie. 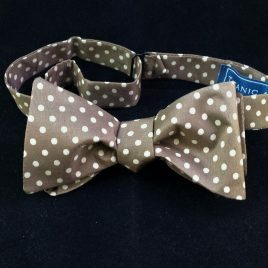 Tan with white polka dots. Simultaneously conservative and whimsical! Also available in a slightly fuller butterfly style. Made from reclaimed fabrics. 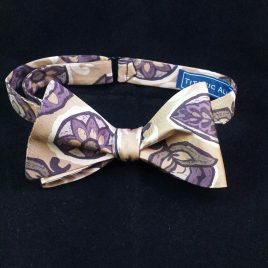 Silk butterfly style bowtie. Tan with purple and green stylized leaves and flowers. A very painterly look! Made from reclaimed fabrics. 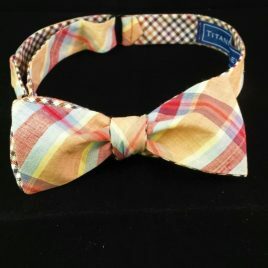 Reversible cotton batwing bowtie, one side in a tan/blue/red madras plaid, the other in a tattersall check in shades of brown. 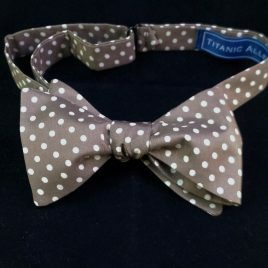 This one is cut a bit narrower for a great vintage look. Best with a jacket with narrow lapels. Made from reclaimed fabrics.